Twitter makes it seem like some people are upset about something 24/7. It's no way to live. It's exhausting just to read it. If I remember one thing about 2014, it’s how the internet, and Twitter in particular, kind of sucked. A little backstory: I’ve been on Twitter since 2009. The microblogging social network helped (or hindered, I’m not sure which is more accurate) me through university, and really started to drive home having the internet — or at least a small microcosm of it — around in my pocket all the time. For the most part, I’ve really enjoyed Twitter. It lets me hear the personal opinions and musings of people I admire and respect, both about topics that interest me and ones that don’t. By following the right people, I’ve had some smart opinions and eye-opening perspectives tweeted into my timeline. Most of my reading material comes from Twitter, and while I don’t watch the news or read a newspaper, Twitter keeps me informed about all the stuff I need to know about. On a more personal level, I’ve averaged about 5000 tweets per year since I joined. I tweet about pretty boring crap, mostly, because that’s just the kind of person I am — one who’s also aware of his public profile and the fact his tweets may eventually be used against him in some way, and the less fuel for that fire, the better. I’ve typically followed anywhere around 600-800 people, which is enough to keep my timeline busy enough to keep me interested and have something new every time I refresh it and enough to not get completely overwhelmed by a deluge of tweets. I generally don’t care about how many people follow me, although I confess it is a nice ego boost to see a large number of people read my drivel. Last year, though, was different. According to my app for Twitter statistics, this time last year I followed 842 people, had 889 followers, and tweeted 19,851 times. Compare that with the current numbers (605 following, 938 followers, and 21,187 tweets) and you’ll see that I unfollowed over 300 people and only tweeted over a thousand times, one fifth that of previous years. Interesting. Chalk it up to the mainstreaming of Twitter or people being unfamiliar with a medium which allowed them to communicate with their social circle instantaneously, every moment of every day, but last year I found out Twitter had disadvantages as much as it had advantages. At first, I realised it was probably unhealthy to be checking something as frequently as I checked Twitter, but at the same time, I didn’t want to miss anything from my carefully-curated list of people and brands/websites I followed. One re-evaluation of my priorities later, and I started the great unfollowing of 2014, culling around 300 people from my list and eliminating that noise from my life. With a less noisy timeline, I could focus on the people and things that really mattered. But even that wasn’t enough. I started taking longer and longer breaks from the service. My weeks-long journey overseas made me realise I could do without reading Twitter for extended days at a time, and when I arrived back in the land of mobile internet and Wi-Fi, not having that constant connectivity meant I didn’t check the service as frequently as I used to. It was good, but at the same time, I felt like I was missing out, like I was out of touch with people I cared about. I returned to Twitter just before the middle of the year. For a while, things were fine: my signal-to-noise ratio was good, and I didn’t feel compelled to read Twitter every waking minute. Then Gamer Gate happened. Overnight, my timeline turned from updates from people I cared about to people retweeting toxic comments into my timeline, leveraging their high follower counts in order to get some kind of public retribution for the offender in question. Suddenly, pretty much every American I followed was obsessed about ethics in game journalism, social justice warriors, and feminism — the latter of which has always been an issue, but a topic I’ve mostly avoided on Twitter thanks to the firefight that usually follows1. Now, though, it was pretty much unavoidable. What happens if the social web as we know it isn’t actually all that social? The idea that a Web site could deliver a more friendly, interconnected world is bogus. The depth of one’s social network outside Facebook is what determines the depth of one’s social network within Facebook, not the other way around. Using social media doesn’t create new social networks; it just transfers established networks from one platform to another. For the most part, Facebook doesn’t destroy friendships—but it doesn’t create them, either. On the face of it, it seems crazy: social networking that isn’t social. But like it or not, Facebook, Twitter, MySpace, and your social network of choice are pretty much everywhere. But what does that mean for you? I mean, aren’t you the one that decides what to post, where? Aren’t you the one that decides how many friends you have, or how privy other people are to your innermost secrets, or at least the ones you choose to share with your fellow socialites? While at least some of that may be true, it doesn’t mean that social networking is all that social. Let me explain. Almost half of the Australian population uses Facebook. And I can tell you from first-hand experience that Facebook is great! Fantastic, even. When Facebook first launched, I remember the stories of how it meant people could keep in touch with people they thought they had all but lost contact with. There was quite a bit of press about people getting in touch with their teachers from high school, or with long-lost relatives, cousins, friends who had moved to other countries. For most people, that was a great thing: it meant that people didn’t have to track down relatives by calling sixteen different individuals just for an email address, or having to go and do the legwork to get in touch with someone from high school. Anyone could just add their friend on Facebook, and that was that. Easy, right? Thanks to this thing called the Internet, Facebook suddenly made the world a smaller place. Now it doesn’t matter what country your friends are in, or whether a few streets away, or a few thousand kilometers, because as long as they’re online, you can talk to them in real-time. It doesn’t matter how separated by geographical distance you are, because the internet is everywhere. It doesn’t matter if you can’t see your friends in person on a weekly or monthly basis, because the internet is always there. To reiterate my original question: what happens if social media isn’t all it’s chalked up to be? What happens, instead of connecting people (hi Nokia! ), the social web just serves as a reminder for how lonely we all are? Granted, that’s a rather pessimistic way of looking at things. Perhaps, then, the above statement could be rephrased as such: as well as connecting people, what happens if the social web also serves as a reminder for how lonely we all are? I have friends that only post the most enthusiastic stuff. They’re seemingly always happy. They’re seemingly always content, and never upset, sad, or anything else. One one hand, that’s great, you know? If they’re happy, I’m happy that they’re happy. But on the other, you have to wonder: if someone is posting about how much they love their significant other, or how great their life is, and I’m here reading their happiest-ever-status, doesn’t that mean my own life is a miserable mess by comparison? When I scroll through page after page of my friends’ descriptions of how accidentally eloquent their kids are, and how their husbands are endearingly bumbling, and how they’re all about to eat a home-cooked meal prepared with fresh local organic produce bought at the farmers’ market and then go for a jog and maybe check in at the office because they’re so busy getting ready to hop on a plane for a week of luxury dogsledding in Lapland, I do grow slightly more miserable. A lot of other people doing the same thing feel a little bit worse, too. 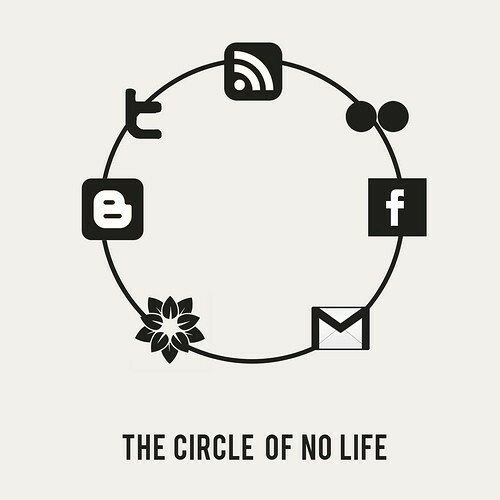 It’s this passive consumption that means the social web might not be all it’s chalked up to be, and it’s this passive consumption that means when you read about how great someone else’s life is, your own life will seem less so by comparison. Real life isn’t like this. You don’t know what the person on the street is feeling. You don’t know what they’re thinking, or how their day is going. If you ask them, you’ll probably find out, but who wants to go around asking total strangers how they’re going, how they’re feeling? Maybe it’s just me, but sometimes I ask myself if any of this social networking stuff is “worth it”. I wonder if keeping up-to-date with Facebook, or Twitter, is “worth it”. What do I gain? The question, once again, could perhaps be better rephrased as: do all these social networks make me feel more connected with people I care about, or less so? I’d like to think that social media has made our lives better. In ways, it has: it means we can talk to our friends in a different time zone. Social media, the social web, whatever you want to call it, has meant that we can connect with Mac enthusiasts from all over the world. It means that we can connect with famous photographers, people we look up to, and yes, even our long-lost relatives or friends that we just lost touch with. But there’s always the other side of social media, the side that everyone seems to ignore just because the advantages seem to outweigh the negatives. The side that says you shouldn’t use the social web to supplement your social activities, but instead use it to complement them. The side that says this “passive consumption” is bad for you. There’s some stuff in there that’s for another time, but for now, you’ll excuse me to post about how good — no, great! Fantastic, even! — my life is on all the social networks. via Geek And Poke: Geeks. Right, so maybe you liked them, maybe you didn’t. Maybe having a publicly-searchable archive of my tweets was a good idea, maybe it wasn’t. Either way, the “Twitter Weekly Updates for week BLAH” posts have now been turned off. Frankly they were just annoying walls of text that (probably) no-one actually read, and they just cluttered up my search results when trying to look for stuff I’d actually blogged. Not to mention the timer which apparently had a mind of it’s own – Sunday 3am is NOT Sunday at 10pm, and there was even that post which was posted on a Wednesday… Argh, what?! The time difference never seemed to be consistent, so I got angry and removed it altogether. Maybe you’ll notice they’re gone, maybe you won’t. Either way, it’s gone, and I don’t plan to add it back anytime soon. If I feel like it I’ll also be removing the previous archives manually with WordPress’ bulk actions. Much love for WordPress’ built-in bulk edit actions. Hundreds of channels, but not a thing to watch. There are so many different social networking accounts that just one person can have, but with all that space to communicate, is anything really being said? If you’re really tricky, you can consolidate your Facebook and twitter into a twitter feed that only publishes excepts of posts from your Facebook person or Facebook page account. But then twitter is nothing more than an RSS feed, which you probably have anyway. If you set up your tumblr just right, you can also pump your posts to twitter, facebook, probably bebo and myspace too if they allowed you to do anything apart from post animated gifs and bad music samples. Entrepreneurs keep coming up with different ways for people to communicate and express themselves, but in the jumble of it all, is anyone listening? via glasnt – Hundreds of channels, but not a thing to watch. – Hundreds of channels, but not a thing to watch.. Critics argue Twitter is 99% noise, and they’re right. This is a complaint that I often come across when discussing Twitter with non-users, they cite media hype and their own experience with Twitter claiming that the majority of tweets on the service are of no interest, or simply “people telling the world about their breakfast” or some variant on the inane comments theory. But they are also missing the point. For any individual 99% of the internet will always be useless noise. For instance, when was the last time you went to YouTube and watched all the top videos and were interested in them all? I’m guessing never. Does this mean that YouTube is useless because so little of the content is of interest to any particular individual? No. 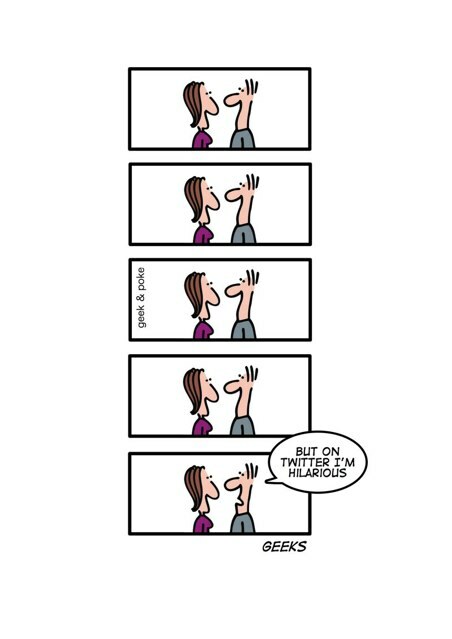 via Pointless Really » Critics argue Twitter is 99% noise, and they’re right..
via The Joy of Tech comic… a Twitter wedgie. It’s beyond me why this is titled “a Twitter wedgie”, but hey, whatever. via The Story (so far) of Twitter | Manolith. Let’s face it, the iPhone and Twitter are the peanut butter and chocolate of the mobile age. They “just work” together. via @TheiPhoneblog: Now with Mo’ Better Twitter! | The iPhone Blog.